Pete Goss MBE is an Inspirational Yachtsman, a Polar Explorer and Inspirational Motivational Speaker. A former Royal Marine, Pete’s life has been dominated by sport and adventure. His record of achievement includes six transatlantic and two round-the-world races. Pete Goss is most recognised for taking part in the 1996/7 Vendee Globe non-stop, single-handed, round-the-world yacht race in his yacht ‘Aqua Quorum’. It was during this race that Pete turned his 50-ft yacht back into a hurricane force headwind to rescue French sailor Raphael Dinelli. He risked his life and any chance of winning one of the world’s great yachting challenges. He dramatically rescued his fellow competitor, for which Pete was awarded the MBE by HM The Queen and the Legion d’Honneur by the French President. Pete’s determination and competitiveness during the race was evident later on in the race when he had to operate on himself to repair ruptured muscles around his left elbow without anaesthetic and just a few basic instructions, after which he joked… “Now I’m truly a single-handed sailor”. Even with these setbacks Pete became the fastest Briton to sail around the world single handed with a time of 126 days and 21 hours. The route goes the ‘wrong way’ around the World, against the prevailing winds and currents. Pete, having spent three years as training manager for the whole fleet of amateurs, proudly went on to lead his own team aboard Hofbrau into third place. In 1988 he defied convention by finishing second in class in the Carlsberg Single handed Transatlantic Race, sailing Cornish Meadow, a tiny catamaran just 26 feet in length. This was Pete’s first fully-sponsored project, which he used to prove that small, lightweight multi-hulls can be viable giant-killers by coming in ahead of many larger craft. In December 2000, Pete gathered together the team and sponsors that enabled the construction of the world famous giant catamaran Team Philips; a five year long project that ended with the sad loss of the boat, but thankfully not the crew, in a freak mid Atlantic storm December 2000. Like all of Pete’s projects Team Philips rested on the four legs of Innovation, Technology, Challenge and Adventure. ‘Dare to Dream’ was the project’s strap line as it challenged many norms including a spirit of community and openness. The Project visitor centre, which was free to enter in keeping with the ethos of the project, saw some 1.2 million visitors. The website generated 97 million hits of which 76% were outside the UK. 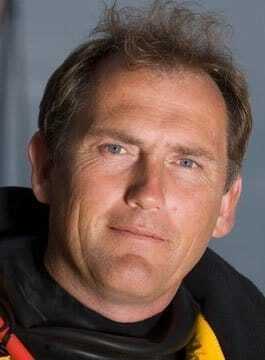 Pete Goss returned to competitive sailing in 2006 competing in the Two-handed Round Britain and Ireland Yacht Race, and in 2007 competed in the Rolex FASTNET 2007, considered one of the world’s classic offshore races, with former Team Philips crew mates Paul Larsen and Andy Hindley. In 2008, Pete built a wooden lugger and followed in the wake of seven Cornishmen who made a heroic journey to Australia 154 years ago – The Spirit Of Mystery. Pete and his crew set sail for Australia on 20th October 2008, arriving on 9th March 2009. Away from sailing, since 2003, in partnership with Arctic Explorer and friend Alan Chambers MBE, Pete Goss has led many teams to the North and South Pole including a team of 15 internationally known business leaders. Together, Pete and Alan lead groups through the barren beauty of the arctic wilderness to the very peak of the planet. Equally at home battling the elements alone or leading a business team from the front, Pete Goss draws from these experiences to offer management talks, team-building exercises and training sessions that will not only challenge individuals and groups, but inspire them to achieve beyond what they thought possible. Pete’s book ‘Close to the Wind’ is his own story. “Absolutely first class. We were mesmerised. Without doubt the most interesting, stimulating and motivational speaker we have experienced….Pete Goss has excellent management motivation." “Pete Goss made an enormous impression on our audience. He had the right mixture of ‘adventures’, pertinent leadership and teambuilding, delivered in a relaxed and personable manner which left our audience with a lot to think about”. “Incredibly motivating. Pete Goss has a unique ability to turn problems into challenges. One of the most thought provoking speakers we have heard."